We’ve talked about social media before and how Facebook could someday die. Facebook probably isn’t going anywhere, but we’ve seen giant social media sites disappear before. In the past, companies have also expressed concern over social media risk. The risk is building a following on a social site like Facebook only to have that social network change the rules or go away completely. If people stop using Facebook or another social site those followers aren’t going to be worth very much. Now we have another example of what is happening in social media. A new study shared on eMarketer found that teens are now using Twitter more than Facebook. It’s a crazy fall for Facebook in just one year. 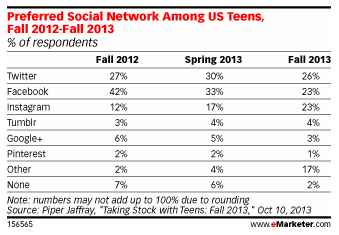 Last year, 42% of teens said that Facebook was the preferred social network. This year that number is down to 23%. Twitter fell a percent, but overtook Facebook as the most preferred social network among teens with the average age being 16.2. Instagram has been the big winner the last year. Numbers have nearly doubled with 23% of teens saying that Instagram is their preferred social network. I guess it’s good that Facebook owns the photo sharing app. Google+ has fallen off with teens by percentage. That’s notable with news that Google+ now has more than 300 active monthly users depending on how you look at those reported numbers. And the final thing in the chart above is the “Other” social network section. It looks like teens are thirsty for something new and something to call their own. We all develop our own preferred channels. People over age 60 generally prefer catalogs. People over age 35 generally prefer ecommerce and search. People under age 30 are very comfortable with Facebook because it launched while they were still in their discovery stage of life. There are may more segments beyond age, but you should get the point that certain groups of people develop preferred channels. Teens simply have more choice today with social networks and you can see how diversified they are with their choices. If your target market is teens you’ll have to really segment your target customer to find where they like to spend their time. Do the same even if your target customer is older. Learn what channels they prefer. That’s where you can reach them. And track their preferences over time to see if it changes. Generally, as people get older their preferences won’t change as much. Teens changing their preferences is one thing, but this also shows the fragile nature of social media right now. That presents the risk mentioned earlier that you could create a bunch of content for a social network only to have it all for nothing later on. The best social media strategy is to own your content. Build content on your website with videos, blog posts, guides and more. Own the content and then use something like The Snippet Strategy to reach your target customer where they are spending time on their preferred social media channel. Social media users are fickle. Some will develop preferred channels, but it’s probably not worth the risk. Build content that you own and control.